Terrestrials are land-based insects, such as beetles, ants or grasshoppers, that are another food source for fish. 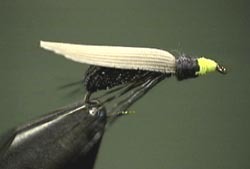 Fished on the surface usually during warm summer months, these flies can be both productive and fun to fish! Great terrestrial pattern tied with foam. 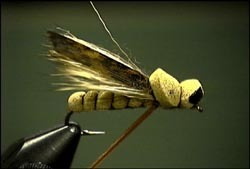 A great summer foam fly pattern. A good replacement for the old Crow Beetle. The highly productive foam body Firefly. 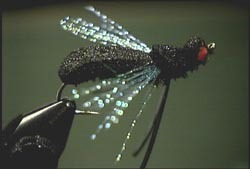 Another great foam fly pattern by Harrison Steeves! A cross between a fly and a beetle. 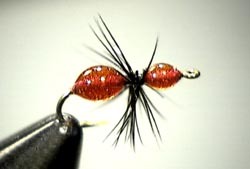 Quick, simple and effective ant pattern using 5 minute epoxy by Harrison Steeves. Listen to his lead-in story about his successes with the Turbo Wasp! The UFO (Unidentified Flying Object) is what Harrison Steeves calls a 'meat and potato' fly. 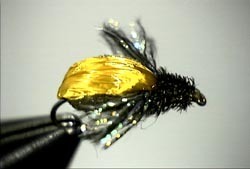 A high vis, high floating foam grasshopper pattern by the foam master Harrison Steeves.